For vehicle buyers today, the importance of quality cannot be understated-especially when spending upwards of $30,000, on average, for a new vehicle. In fact, the J.D. Power and Associates 2011 U.S. Vehicle Dependability StudySM (VDS) reveals that reliability/durability is the single-most-important factor when buyers are considering a new vehicle, even more so than fuel economy, interior comfort, or exterior styling. Fortunately for consumers, automakers continue to make steady gains in long-term vehicle quality across the board. "Reliability/durability is the single-most-important factor when buyers are considering a new vehicle." Even though, according to consumers, Asian manufacturers achieve higher levels of long-term vehicle quality than do their counterparts in Europe and North America, further analysis reveals that significant differences in the levels of long-term vehicle quality exist depending on where a vehicle was built. For example, vehicles built by Asian manufacturers in Asia achieve a score of 133 PP100, whereas those built in North America achieve a score of 146 PP100-a difference of 13 PP100. Likewise, vehicles built by European manufacturers in Europe come in at 156 PP100, whereas vehicles built by those same automakers in North America have 170 PP100-an even bigger difference of 14 PP100. This suggests that manufacturers have some work to do when it comes to making sure that quality standards are fully understood and adhered to by their overseas workforce-so that consumers on both sides of the ocean benefit from the same levels of quality.In addition, the dependability of domestically produced cars has improved at nearly twice the rate-19% over three years-as that of imported cars (10% over the same period). Conversely, the quality of imported trucks (up 12% over the last three years) has improved more than twice as fast as that of domestically produced trucks (up only 5%). Also, imported crossover utility vehicles (CUVs) hold a 7-percentage point advantage in vehicle dependability over domestically produced CUVs (16% vs. 9%, respectively). According to the 2011 Vehicle Dependability Study, batteries are the most commonly replaced vehicle component during the third year of ownership. In all, 5.8% of survey respondents indicated that they had to replace their car or truck battery during this time, much sooner than the 4-5 year life expectancy that is sometimes indicated in advertising by battery makers. This may suggest that all of the technology found on today's vehicles, which seems to be increasing by the day, is having a negative impact on battery life. The other two most commonly replaced vehicle components were brake rotors (5%) and tire-pressure-monitoring systems (3.7%). Overall vehicle dependability improves in 2011, from 155 PP100 in 2010 to 151 PP100 in this year's study. The most commonly reported problems by owners of three-year-old vehicles are: excessive wind noise; noisy brakes; and paint that is peeling, fading or chipping. Among individual nameplates, Lincoln ranks highest in vehicle dependability with a score of 101 PP100. It is followed in the rankings by Lexus (109 PP100) and Jaguar (112 PP 100). Rounding out the top five nameplates in vehicle dependability are Porsche (114 PP100) and Toyota (122 PP100). 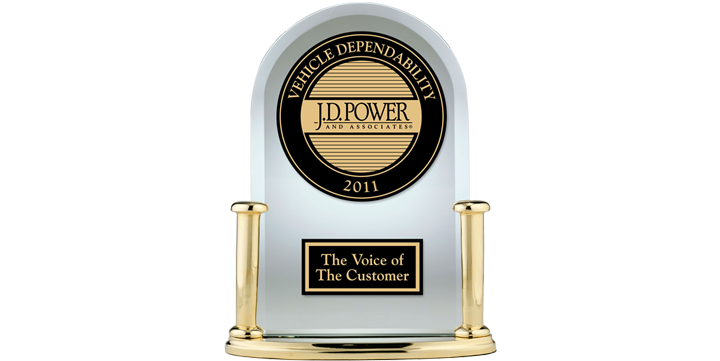 Nameplates with the biggest year-over-year improvement in vehicle dependability are: Jaguar and Suzuki (both improving by 63 PP100); Land Rover (43 PP100 improvement); Scion (35 PP 100 improvement); and Volkswagen, which improves its vehicle dependability by 34 PP100. Among corporations receiving the most individual model awards, Toyota Motor Sales leads with seven, receiving awards for the Toyota Prius, Scion xB, Toyota 4Runner, Toyota Tacoma, Lexus RX, Toyota Sienna, and Toyota Tundra. Ford Motor Company receives four model awards, one each for the Lincoln MKZ, Ford Fusion, Ford Mustang, and the Lincoln Navigator. General Motors Company receives three model awards, for the Buick Lucerne, Chevrolet Tahoe and Cadillac DTS. Also, Honda Motor Co. receives awards for the Honda Fit, Honda CR-V and the Acura RL. The three most improved models in vehicle dependability are the Dodge Nitro (106 PP100 improvement); Mitsubishi Galant (85 PP100 improvement); and the Suzuki SX4 (74 PP100 improvement). The three models with the biggest decline in vehicle dependability are the Dodge Ram 2500/3500 pickup (98 PP100 decline); Nissan Titan (65 PP100 decline); and the Infiniti M-Series (61 PP100 decline). Among car models, the top overall performers are the Porsche 911 (68 PP100), Lincoln MKZ (79 PP100), and the Acura RL (85 PP100). Among CUVs, vans and SUVs, the Honda CR-V, at 83 PP100, is the highest performer, followed by the Subaru Forester (100 PP100) and the Lexus RX (101 PP100). Pickups with the highest long-term quality are the Toyota Tacoma (109 PP100), Toyota Tundra (118 PP100), and the Ford F-150 (122 PP 100). In the van category, the Toyota Sienna (150 PP100) leads the way in vehicle dependability, followed by the Ford E-Series (185 PP100) and the Honda Odyssey (193 PP100).